Best Stand Up Paddle Board for Beginners Reviews 2019 | Is Wavestorm #1? 5 Best Stand Up Paddle Board for Beginners Reviews 2019 | Is Wavestorm #1? Stand up paddle boarding is the fastest-growing sport in the world. Why? Because it gives you a full body workout and it’s really fun! You don’t need to vacation to the ocean to go stand up paddle boarding. Grab your board and head out to the nearest lake, river, or bay and paddle your way to enjoyment. Besides the stand up paddle board you’ll need a paddle, a leash to keep you attached to your paddle, a traction pad to give you solid grip under your feet, and a personal flotation device, or life vest. It’s a great sport for the young and old and it’s easy to learn how to do it. You can even board with two people on your board. Give it a try! Purchasing an inflatable or solid stand up paddle board depends upon where you plan to use it, where you have room to store it, and whether you have room to transport it. If you are a recreational and occasional boarder, there are plenty of reasons to opt for an inflatable stand up paddle board. They hold up well enough for occasional use. It goes without saying that they are easier to store and transport than solid boards. 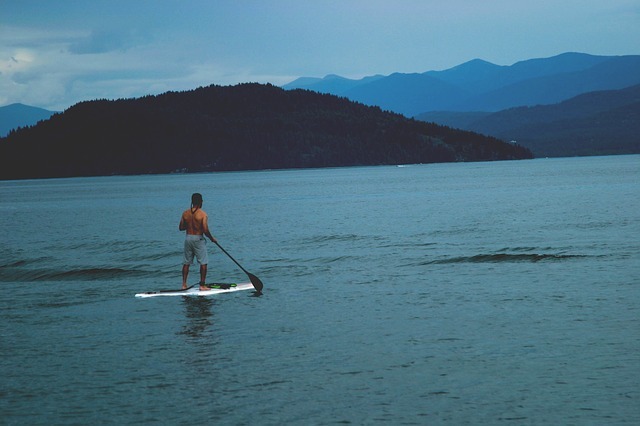 Most of the time, paddle boards are used on flat water like streams, rivers, channels, and small lakes. If you’re taking the board on a hiking trip, the inflatable board is the way to go. It’s also the way to go if you have to walk a long distance from your car to the water. Inflatable boards won’t stand up to large waves and choppy waters as well as rigid boards. You’ll also need time to inflate and deflate the board. Of course, if you’re still not sure, get one of each. The prices are right to get a couple of them and experiment around with them to see which one you prefer. This stand up board is excellent for boarders with all skill levels. It’s made from military-grade PVC, so it’s almost indestructible. It measures 10’ x 30” x 6” and holds boarders up to 250 pounds. It’s just as firm and stable as rigid boards. It deflates and rolls up compactly for easy transport and storage. It comes with a 1-year warrantly. Looking for a board to use on flatwater, river runs and small waves? This board is for you with its surf-style design and mazing durability. You get to be a little rough with this board without worrying about ruining it. It’s made of military-grade material that lasts forever. Roll it up and it’s about the same size as a sleeping bag. It comes with a 2-year manufacturer’s warranty. This is a cool rigid board with closed cell EPS foam core with double reinforced wood stringers. It is made of a high-density lightweight EVA deck and deck padding. It has a built-in handle for easy loading and you can bungee it down with the cargo straps that are included. It includes an adjustable length aluminum SUP paddle. If you’re looking for an inflatable board that is rigid, this board by Tower Paddle Boards is a smart choice. It feels like a hard board underneath you and it holds up to 350 pounds. You’ll have no worries about dings and cracks because of the military-grade material construction. It’s ultra easy to store and transport and it comes with a pump and 3-piece adjustable paddle. It’s a great beginner board that will take you to more advanced skills. This is a rigid board that is made of built-in polycarbonate fiberglass. It’s durable, but surprisingly, it only weighs 25 pounds. It’s created from a hybrid composite core with three marine stringers and a soft foam deck. The 10’ x 6’ board provides stability on water for people up to 350 pounds. There’s no need to worry about an inflatable board springing a leak and leaving you stranded in the water. Most of the inflatable stand up palled boards are made with military-grade materials. You’ll want to check out the surface of the board to make sure you get plenty of traction. Always check the weight limit whether you have one or more than one person on the board. There are plenty of inflatable and rigid boards to choose from, so it’s easy to find the one that works best for you.